Development of this vehicle started in 1943, with 25 vehicles planned for production within a year. Two prototypes passed trials, but never saw action. Affectionately nicknamed the "Doom Turtle" or "Doom Snail", the T95 is slower than the T28, but has much improved armor. 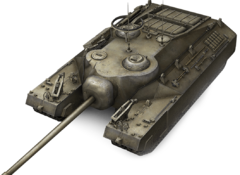 In fact, this behemoth has the highest value of frontal armor of any tank in the game, tied with the T110E3, and its armor is very good for its tier, especially in the front and sides; but in exchange for heavy armor, the T95 has a sluggish top speed and hull traverse, even slower than the Maus in terms of top speed. Having the 105 mm AT Gun T5E1 mounted is rather lacking for its tier, so getting the 120 mm AT Gun T53 from the T28 is a must to help the grind for the 155 mm AT Gun T7. The T95 equipped with this gun is a force to be reckoned with, rivaling even the nasty 152 mm BL-10 of the Object 704 and ISU-152. In WOT PC, this tank is a rather rarely seen TD. Despite all the armor, its slow speed, traverse rate and wideness contribute to it being an arty magnet. In WOTB however, the T95 is a completely different beast. Although it is the slowest tank in the game, the T95 can take an incredible amount of abuse before going down if handled correctly. Keep in mind that the T95 is very intimidating to anyone facing its front, making it perfect for defense or to block off an area and prevent the enemy from advancing. In some players' opinion, the T95 is superior in multiple ways to its upgrade, the T110E3. The T95 is a true force to be reckoned with as its massive amount of armor, the ferocious 155mm can quickly cause enemies to dive for cover, as they fear both the damage it can cause and its ability to take out tanks in one fell blow. It's a tank that can both break stalemates single handily or else hold multiple tanks at bay by itself (As long as they are denied the ability to flank or easily hit weak spots), giving your team the advantage of numbers, or precious time else where to break through lines or hold off pushes. That being said, it is important to use those strengths to your advantage, should you have one on your team. Tall tanks, such as the Maus, can use it as a shield to hide their lower glacis while providing very useful firepower to suppress targets from the side. Small tanks can almost completely hide behind it, letting the T95 push forward for them, blocking and absorb damaging while they pop out and take a quick shot or deny opponents the ability to flank the T95 itself. In desperate situations, the T95 can shatter a hostile push, given the right conditions. Although the T95 may have plenty going for it, the tank holds a few huge, Achilles' heel scaled weaknesses. The most obvious of these is a horrible speed, coupled with poor turning radius and dreadful power to weight ratio. All of these issues culminate from a weak tier 6 engine that had difficulty moving the lighter, but still very heavy T28 in the first place. Adding 30 additional tons to the tank only makes the tier 6 engine all the more underpowered, It takes an age to turn, and what feels like an eternity to get from one side of a map to another. Scouts, mediums, and even a considerable number of heavy tanks can taunt at the T95's inherent lack of turning speed, though this steep disadvantage can be softened somewhat with clutch braking.However off-road driving eases the burden on the T95's agility when on soft and moderately soft terrain. But the poor speed is a double edged sword. While the T95 may not be able to relocate very quickly, it can fire on the move without sacrificing much in accuracy, however, this brings up the second major weakness of the T95. The accuracy of the 155mm gun, the T95's greatest asset, is far from stellar. Even though it is the same gun found in the T30, and enjoys some minor buffs on the T95 (a 0.01 accuracy buff, 0.42 increase to RoF, and a 0.4 second shorter aiming time) The gun's accuracy is still easily outmatched by nearly all other tier 9 and 10 guns found on the TDs of other nations (Except the FV 215b 183s which has a horrid dispersion of 0.4). This makes firing on the move all the more complex. It also makes long distance sniping, which this tank should do well in on paper, according to its characteristics, in reality an unfairly poor proposition for the T95. Even at close range, the poor accuracy is still hard felt, making intentional 'trick shots', hits on small or relatively tricky to hit weak spots, and in some cases even lower glacis shots miss their mark or land in the entirely wrong place, and in extreme cases, repeatedly. Shots that you could be certain would hit their mark on any other tier 9 TD can unexpectedly miss when in the T95. The fact there is no way to increase this 'Fully aimed' accuracy other than to install Vents and hope it affects it does not help. Yet In most cases, poor accuracy is countered with both a rather good rate of fire and exceptional damage. But in the T95 that is not exactly the case. While the 155mm does in fact sport an extremely nasty damage potential, its rate of fire, despite being vastly better than in the T30, is still outmatched yet again by many same tier, and even higher tier tanks. Many tier 9 TDs from other nations will be able to fire 2, or even nearly 3 shots (Thanks to the presence of the Tortoise) for every 1 shell the T95 is able to load and fire. Thankfully, as with the poor turning radius and very bad handling in soft terrain, the reload speed can be boosted with the installation a Tank gun rammer, and when the T95 is heavily damaged, a loader with a 100% skill in Adrenaline rush in addition to the tank gun rammer. Yet in encounter matches, it is best to avoid marching straight into the base if there is a risk it can take fire from all directions. In urban environments, the T95 becomes a completely different beast. In these situations, move forward and do not remain in very close proximity to the base unless in an encounter match. Play aggressively and land as much damage as you can, remember to have some backup in case you get flanked. A T95 driver that is able to effortlessly weave a trail through the urban streets without taking much damage can very easily mop the match floor, sweeping enemies off the battlefield, deflecting large amounts of damage and dealing an even larger amount right back. Like the T28, with the right skills and equipment the T95 is also a good urban brawler despite its slower speed and lower agility. The fear factor of this tank means that players can make mistakes, use these instances to your full advantage, especially if there are virtually no other tier 9 or 10 tanks around. narrow streets can be a blessing and a curse for the T95. A blessing in that it becomes considerably harder and takes longer for opponents to flank your tank, but at the same time, albeit risky to take corners along intersections. When going around street corners, start wide, gradual turns early, this exposes less of your side to enemies when you reach the bend and in addition angles that side armor, making any shot made onto it have a greater chance to bounce. When playing alongside a T95, although it may not help much, pushing the T95 to its destination shaves precious seconds off the time it needs to get there, and as in war, time can make the difference between victory and defeat. When the T95 fires a shot, give it covering fire, distracting enemy tankers while allowing it to reload for another punch. A T95 that takes a negligible amount of damage through much of the matches course will most likely survive it. Due to the insane amount of armor that nearly covers the entire tank's front, the two weak spots, the lower glacis and the two cupolas, are the only things any tier 6, 7, and even 8 tank has a hope at penetrating if you greet them head on. And even then, wiggling, as if the entire tank were a turret, leaves shots most could make while you are standing still extremely difficult. Handle this tank correctly and you have a good chance to deflect jaw-droppingly enormous amounts of damage in matches, even from other T95s and tier 10 tank destroyers! 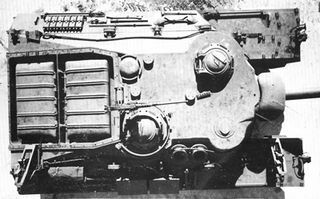 The engine and the radio come from the T28, so mount them before upgrading the tracks. You need the tracks to mount the 120mm, then you can grind the 155mm, but you can use the Upgraded Suspension to unlock the 120mm. 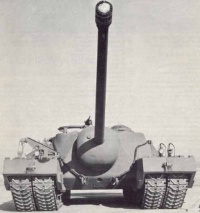 The power package in the T95 (T28) was essentially the same as in the M26 Pershing tank, although the weight of the new vehicle was more than twice that of the latter. To handle the T95 (T28), the 500 horsepower Ford GAF engine and the torqmatic transmission required a final drive gear ratio that reduced the maximum vehicle speed to about eight miles per hour. In fact, the maximum recommended sustained speed was seven miles per hour at 2600 rpm. 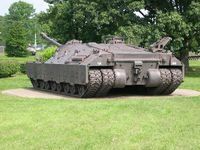 Due to its extreme weight and low engine power, the T95 (T28) had extremely limited obstacle-crossing ability and could not cross any of the portable bridges available at the time. The great weight of the vehicle also required considerable ingenuity in design to reduce the ground pressure to an acceptable level. This objective was achieved by the use of two sets of tracks on each side. The outer set, along with the four inch thick armor side skirts, could be removed and towed behind the vehicle when operating on a hard surface. Removing the outer tracks also reduced the overall width from 179 1/2 inches to 124 inches permitting rail transportation. At Aberdeen, an inexperienced four man crew removed the outer tracks under field conditions in four hours on their first try. An equal amount of time was required to reassemble them onto the vehicle. By the third try, the same team had reduced the time to remove or replace the outer tracks to 2 1/2 hours. The heavily armed and armored T95 did not quite fit any of the usual categories for U. S. Army fighting vehicles. For example, tanks were expected to carry their armament in fully rotating turrets and self-propelled guns usually were lightly armored to achieve maximum mobility. The T95 did not meet either of these criteria and in June 1946, there was another name change. At that time, OCM 30758 redesignated the vehicle as the super heavy tank T28. It then was considered that the combination of heavy firepower and heavy armor was more appropriate for a tank than a gun motor carriage. 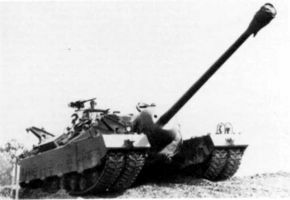 Regardless of the name, the T95 (T28) was under test at Aberdeen Proving Ground until late 1947, primarily to evaluate the durability of components on such a heavy vehicle. A total of 541 miles of operation was completed consisting of 128 miles on roads and 413 miles on gravel. Needless to say, the mileage accumulated slowly because of the low normal operating speed of five to six miles per hour and the low priority assigned to the project. Work was terminated before completion of the program in compliance with a War Department policy to discontinue development on combat vehicles in the 100-ton class. In 1947 one of the T95 (T28)'s was heavily damaged by an engine fire during trials at Yuma Proving Grounds and scrapped, and the other T95 (T28) was reported broken up and also sold for scrap. In 1974 the last prototype was discovered abandoned in a back field at Fort Belvoir, Virginia. It is unknown where it spent the intervening 27 years. It is the sole remaining example of these tanks and was exhibited at the Patton Museum of Cavalry and Armor in Kentucky. This page was last modified on 21 November 2017, at 06:46.